Verdant forests, rugged peaks, and turquoise seas. The Marquesas are one of the best known yet least visited archipelagoes in the South Pacific. The Polynesian discovery of these stunningly beautiful islands around 800 years ago represents one of humanity's momentous achievements; and that was only the beginning. By the time Captain Cook reached these shores, Marquesan chiefdoms were distinguished by their monumental architecture, elaborate art, and a religious system in which important ceremonies demanded human sacrifices. Vaitahu (left with village) and Hanamiai (right with sports center) Valleys on Tahuata, Marquesas Islands. 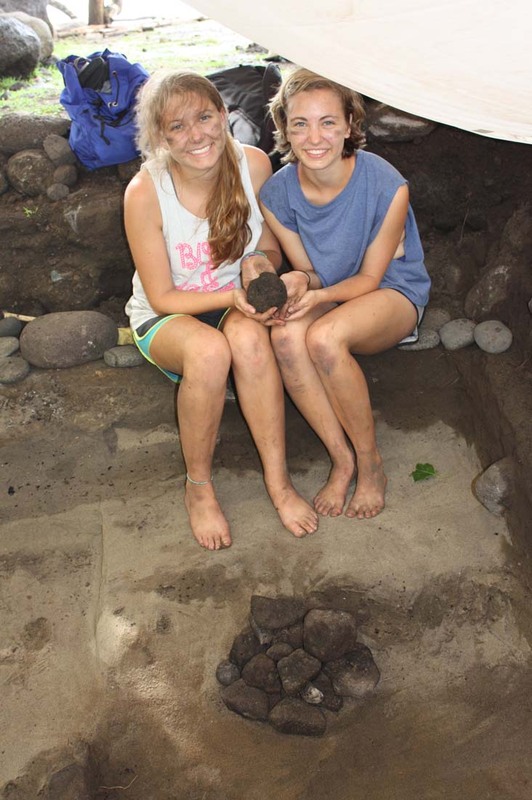 Emma Kousouris and Christine Zenel with a stone fishing weight discovered while excavating an ancient earth oven. Our 2020 project centers on the neighboring valleys of Vaitahu and Hanamiai. Vaitahu, with a population of 400, is the main village on Tahuata, one of the most remote and traditional islands in the Marquesas. On the coast of nearby Hanamiai lies one of the richest and most extensively studied archaeological sites in Polynesia. Here, hidden beneath the roots of coconut palms, is a captivating record of daily life in the Marquesas dating back to initial Polynesian discovery around 1200-1300 AD. Vaitahu and Hanamiai are located on the coast of one the best ports in the Marquesas. Captain Cook was here in 1775. His accurate maps and glowing description attracted a steady stream of whaling ships and sandalwood traders. The French navy arrived in 1842 to claim the Marquesas as a colony, They built a massive fort on the hill separating Vaitahu from Hanamiai. This fort, with its moat and high stone walls, is still standing. The field school combines excavations at Hanamiai with work at Te Ana Peua (The Tahuata Museum), the first community-based archaeology museum in French Polynesia. 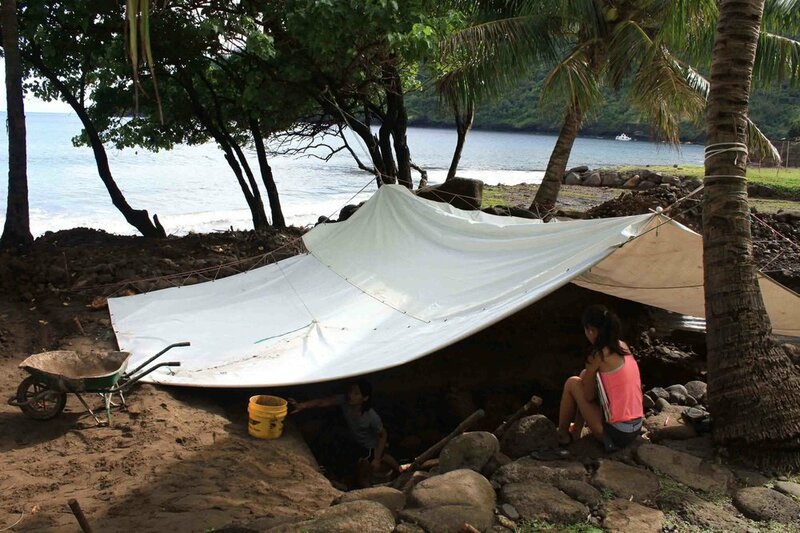 The field school is a collaborative project in which an international team of students works closely with members of the local community, under the direction of University of Hawai’i archaeologist Barry Rolett. Marquesans are bilingual. They learn Marquesan at home and French at school. 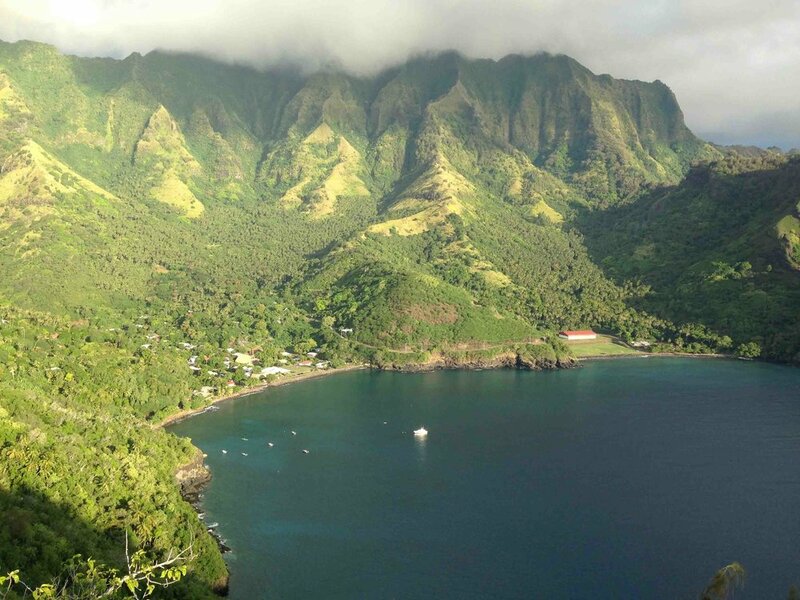 Our headquarters are in the picturesque village of Vaitahu, on Tahuata (Gauguin lived and painted nearby on Hiva Oa). There are no hotels (just one local store stocked with cold drinks, etc.). There is also essentially no service economy: no restaurants, taxis, or professional tour guides. Our hosts are the 400 wonderful inhabitants of this unforgettable world. We'll live just a short walk to the beach, in a rented house with modern kitchen and toilet facilities (albeit cold water showers scarcely a problem in this tropical climate). Samuel Tiaiho uncovering a 700 year old pearl shell lure shank found more than two meters below the ground surface. Barry Rolett, Project Director and Te Ana Peua Museum cofounder with field school students Michelle Kim and Emily Lowe. Who can apply? Students and members of the general public. Preference given to applicants with French language skills and course work in anthropology and archaeology. When? ca. June 23 – August 4, 2020. Project Director: Barry V. Rolett. Dr. Rolett is Professor of Anthropology at the University of Hawaii and he also serves as President of the Andover Foundation for Archaeological Research. He is a specialist in the archaeology of Polynesia and southeast China. Dr. Rolett graduated from Phillips Academy Andover and Pomona College (1980). He received his Ph.D. from Yale University in 1989 and joined the University of Hawaii faculty during the same year. He taught at Harvard University (1998/99, 2000/01) and Keio University (Japan) (2015) as Visiting Professor. Dr. Rolett first visited the Marquesas in 1981 during a year-long Thomas J. Watson Fellowship project that involved retracing Captain Cook's route through the South Pacific. All artifacts discovered during the Hanamiai excavations are conserved and exhibited on Tahuata, in Te Ana Peua, our community-based museum. White sand deposits of the Hanamiai Dune allow for the extraordinary preservation of artifacts made of shell and bone. Trolling lure shanks and points discovered during the Hanamiai excavations. Artifacts such as these from the deepest deposits at Hanamiai date to the time of the earliest Polynesian settlement of the Marquesas, 700 - 800 years ago.